Pizza and delicious smallgoods in one? 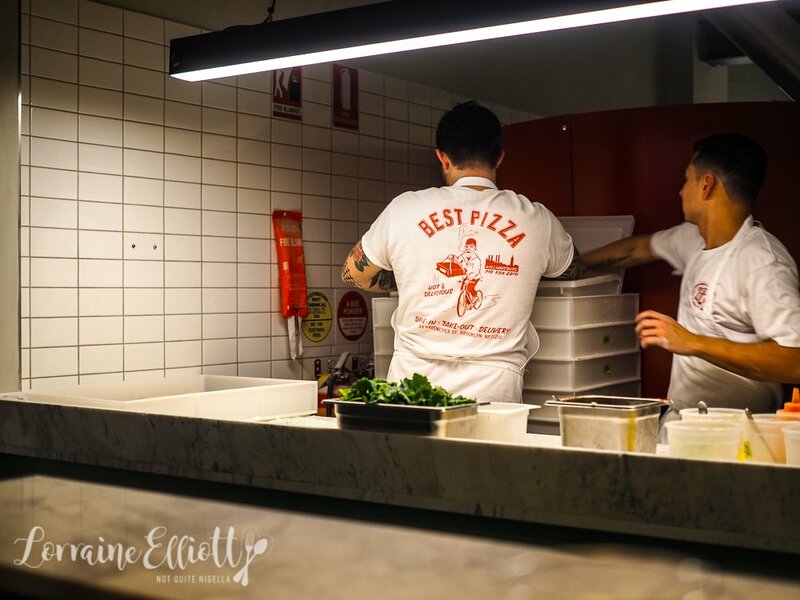 Bella Brutta is the newest pizza place in Sydney that is a partnership between LP Quality Meats and Porteno. 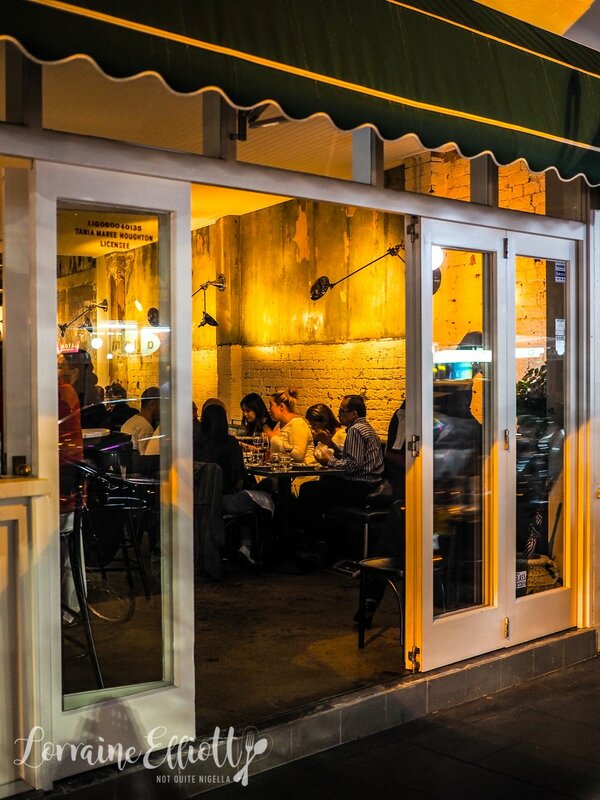 Bella Brutta meaning "beautiful ugly", combines puffy edged pizza, delightful salads and a good wine list. 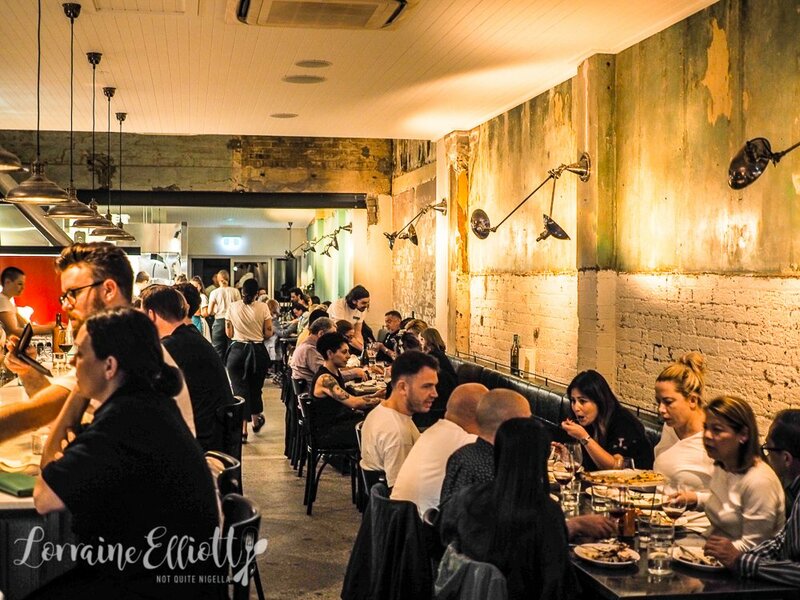 In these early days it pays to walk into Bella Brutta with a reservation (or you'll join the throng without one who line up and then get turned away). However don't despair if you don't have one, there is also a waiting list that you can join as we did. Half an hour later we receive a call from Bella Brutta telling us that a table has cancelled. "We've been here before," says Mr NQN looking around quizzically. Bella Brutta is located where Mad pizza used to be on King Street near Missenden Road in Newtown. The space is milk glass green and whites with bar seating and a wall of banquettes. We are seated at the bar next to Luke Powell who is busy shaping pizzas. 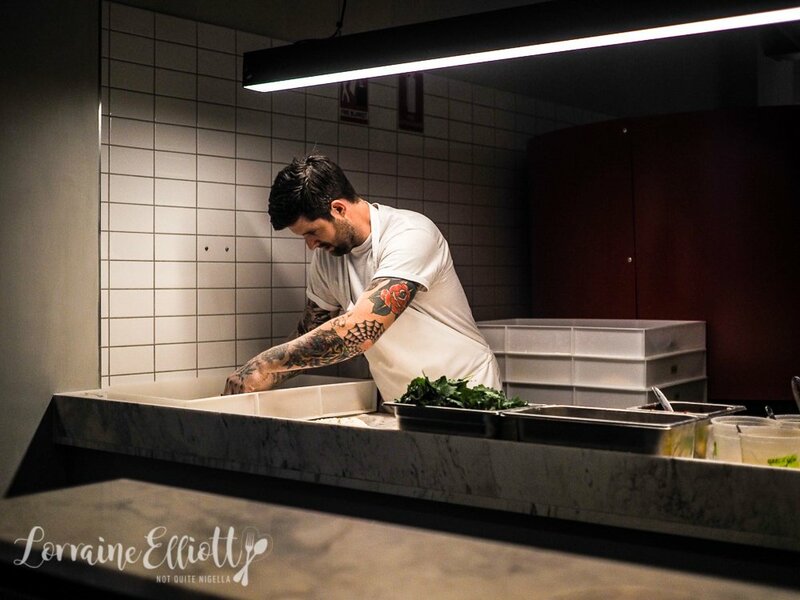 Flour coats all surfaces and he and another chef tag team shaping pizza and sliding them into the oven from Modena in Italy. They emerge, blackened on the edges and with puffy sides. Spread, sauce, sprinkle, slide and repeat. "Do you think he gets sick of making pizza?" asks Mr NQN. Our waitress is lovely and helpful and suggests that typically people order a pizza and antipasti each. 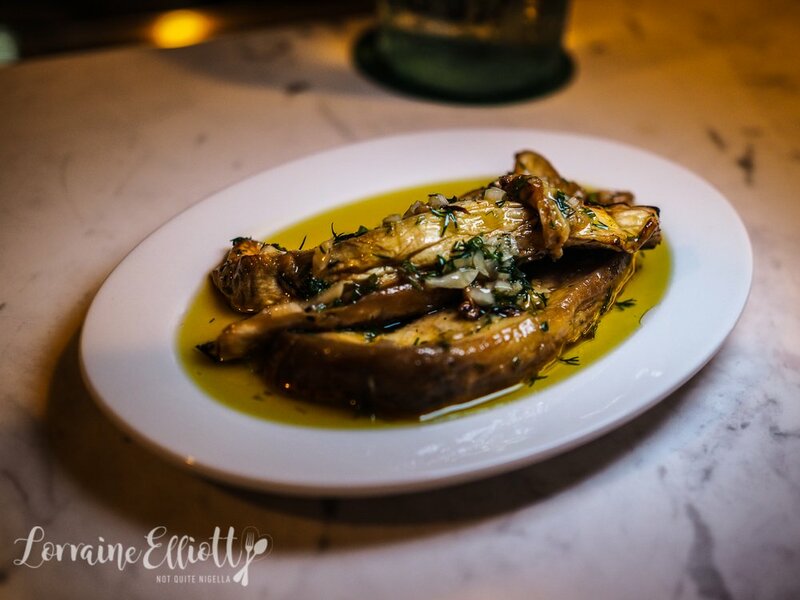 The eggplant vinaigrette arrives first, three long soft batons of creamy eggplant sitting in a pool of herbed olive oil redolent in garlic, vinegar and dill. I'm picturing myself dipping the crusts in the oil already. Whenever I see stracciatella cheese, I'm immediately drawn to it, like small dogs, pastries and quirky people. 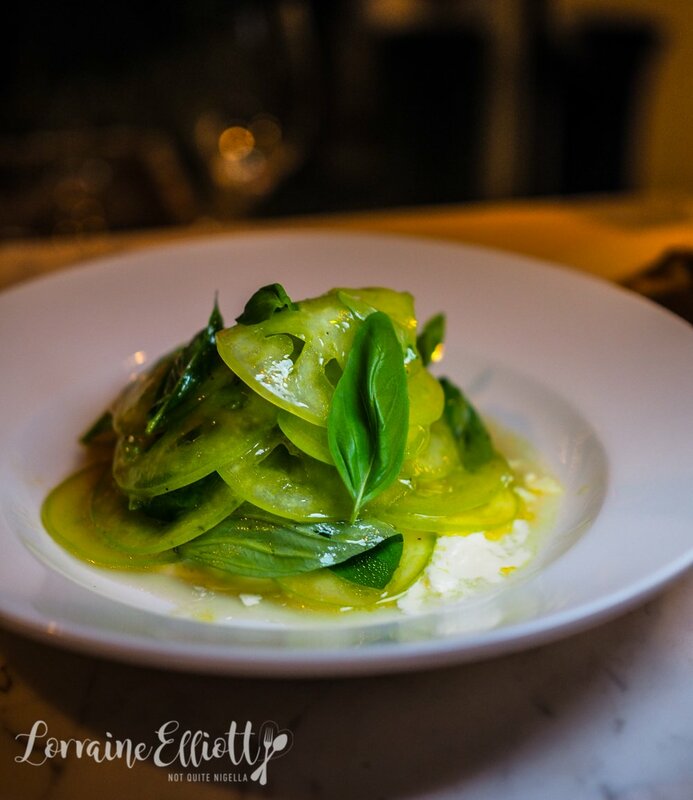 The green tomatoes are sliced thinly and sit atop soft curds of stracciatella (the centre of burrata cheese) with fresh basil leaves. Both of these sides are great for lightening up a carbolicious pizza meal. We asked for some recommendations for the pizza and we were recommended one tomato based one and one cheesy based one. Truthfully I'm not one for pizza bianca-sauce is where it is at for me but I'm persuaded by the mortadella. 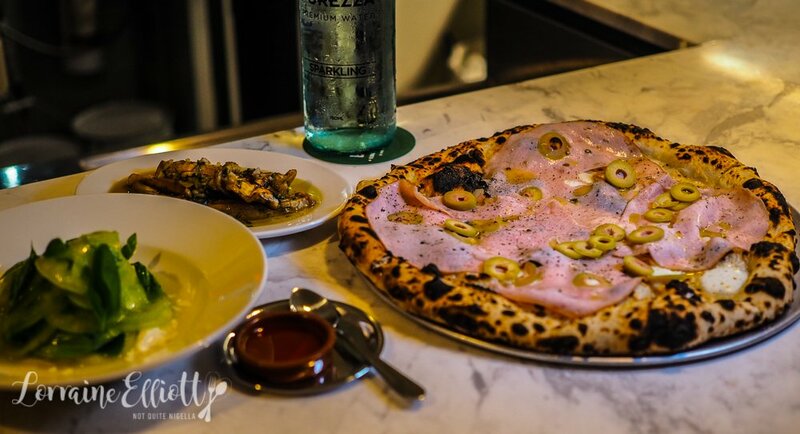 This has thinly sliced mortadella, fior di latte, garlic, parmesan and green olives. And although this doesn't have tomato it is my favourite of the two pizzas. The pizza crust is slightly crisp in the centre where a Napoletana pizza is normally wetter. The tradeoff is that a lot of the crust is burnt in patches, more than a Napoletana. I really thought I'd go more for the pepperoni pizza but didn't. 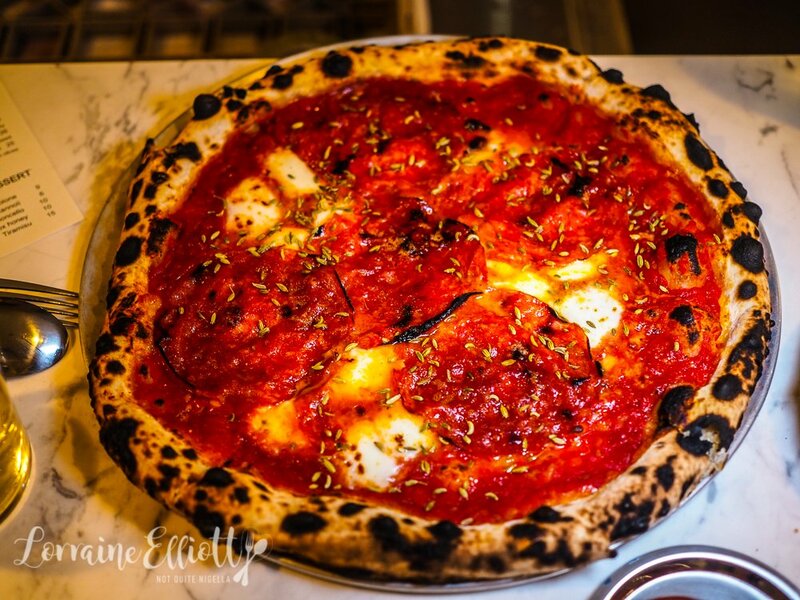 The pepperoni pizza is topped with tomatoes, fior de latte, parmesan, large, thin slices of pepperoni and a generous scattering of fennel seeds. The predominant flavour of this pizza is actually the tomato and fennel seeds rather than the gutsy chilli or garlic from the pepperoni. 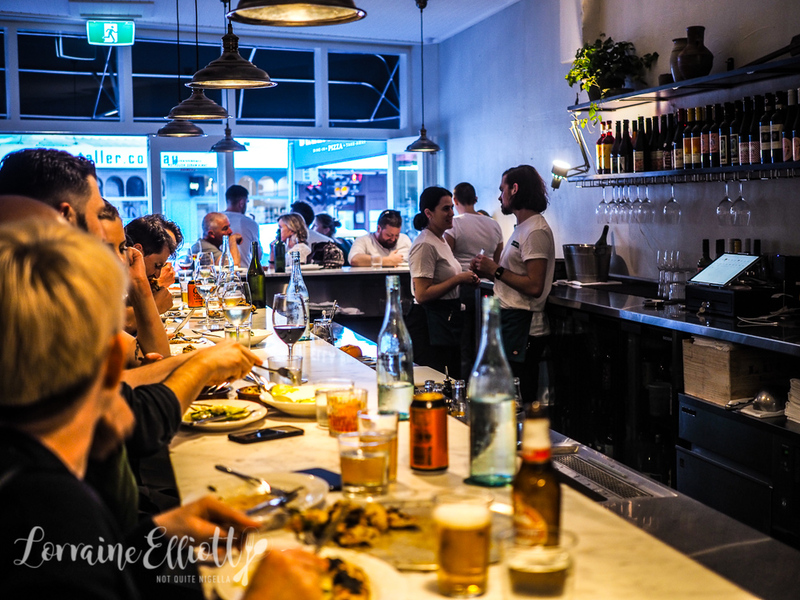 I think I was expecting more featuring of the smallgoods and meats of which I have really liked whereas they do tend to take a backseat to the pizza or actually the salads which I prefer. The dessert choice are really one for me (bombolone) and one for Mr NQN (ice cream). 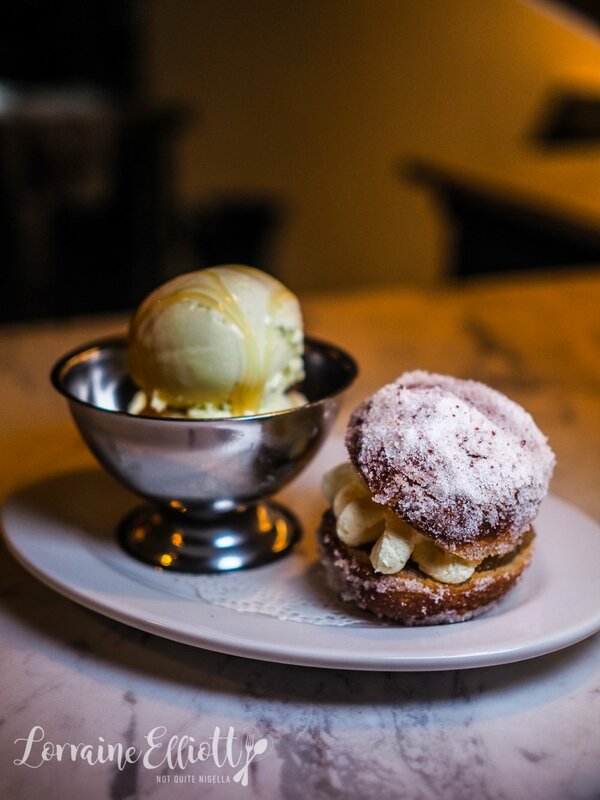 I take a bite into the freshly fried bombolone, split in half and filled with stewed apples and Amaretti flavoured mascarpone and it's a delicious juxtaposition of hot and cold and soft and crunchy at the same time. I also try the fig leaf ice cream with its distinctly gorgeous flavour (it's like almond and well, figs) and it's smooth and delicious. I almost feel like I'm missing the point preferring the salads and desserts! So tell me Dear Reader, are you more a donut or ice cream lover? And do you like tomato or white pizzas? Do you always book when you eat out if you can?